Get a movie voucher worth Rs. 150 on min purchase of 2 tickets. Lager n Barrel Festival is a rock and roll beer festival to celebrate beer, music and the love of a good time. The city's first beer festival, ranging from late afternoon through the night, offering a diversity of beers available for tasting and purchase, intends to ensure that the festival goers experience full flavour of life through enriching music acts, lovable activities, delicious food and endless beer. For what it is, Lager n Barrel is poised to turn into summer playground for beer lovers. Deepak Rathore Project: Deepak Rathore Project gives purest vibes that comes straight from Heart. The voice behind Shimla Tha Ghar, Pahadan, Ja tujhko & more came into light because of his soothing & enchanting voice. Kutle Khan Project: Kutle Khan is a unique collective of Rajasthani Folk musicians. He embodies the rich melodic and sophisticated rhythmic traditions of Rajasthani folk music and his performances are informed by his understanding of contemporary and western musical traditions. The Doorbeen: Aaj Da Ranjha...peenda ganja..!! The Doorbeen is the powerful voice behind #AajDaRanjha, #Lambergini and others. They are known for incredible live performances. Funky Boys: Funky Boys is a band based out of New Delhi. They are a fusion of dance, funk, bhangra, hip-hop and Bollywood.They are coming to paint the town red with their super energetic performance. The Local Train: Local Train is a rock band from Delhi. They are known for its emphatic lyrics - a blend of Urdu and Hindi. Their signature lies in a raw and honest sound which resonates with the youth. So get ready to groove on "Khudi", "Aaoge Tum Kabhi", "Cho Loo" and more at the Most happening festival . Lost Stories: Lost Stories needs no introduction. The mighty duo is responsible for captivating and spearheading the Electronic Dance Music scene in India. 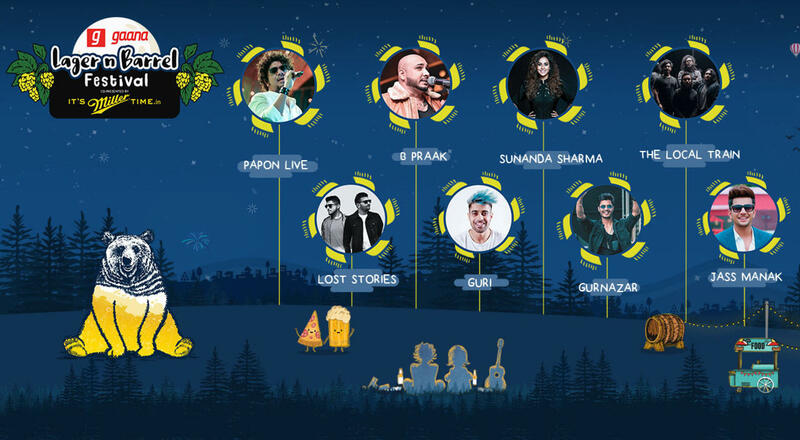 From having performed at Tomorrowland and Summerfestival, the band is coming to boom Chandigarh with their mighty beats on at Gaana Lager n Barrel festival co-presented by Itsmillertime.in! Are you ready for the mega eve? Just Ittefaaq - It is a coincidental collaboration of lyricist Polly Saghera along with her daughter — singer Jasleen Aulakh. This contemporary music project breaks free from all confinement of language and genre to create soul stirring music. Faridkot: Faridkot is a Psychedelic Rock band from Delhi, formed in 2008. Riding early on the wave of sufi music influx that is still flowing in, they have carved out a cult following for themselves in the North. Faridkot’s music is a mixture of shifting blues guitars and harmonic love melodies blended around a thumping percussion and bass, described in certain circles as Confused Pop . The Musical Journey by B Praak:- B Praak, the gabru of Punjab and a victor of countless hearts has bought astonishing hits to the Punjabi music industry. His love for music has lead to creation of The Musical Journey by B Praak which is a special musical act featuring various musicians and singers. He is bound to create magic with this mega special act. Papon: He is a name that needs no introduction! A multi-instrumentalist, composer, producer and singer has become one of the most recognizable-and-sought-after voices in India.